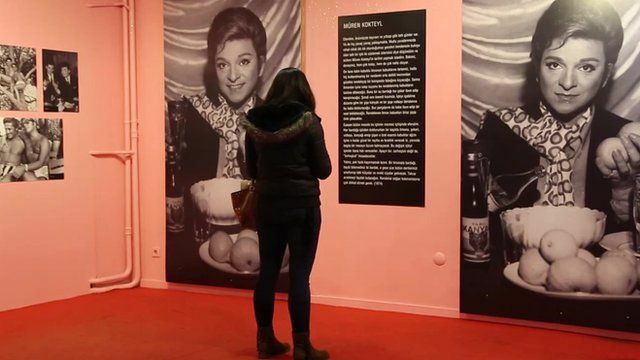 Turkey's first gay icon Zeki Muren Jump to media player An exhibition that charts the colourful life of Zeki Muren, a gay icon and Turkey's most famous singer, has been drawing record crowds. Kurdish singer Perwer back in Turkey Jump to media player After 37 years in exile, the world's most famous Kurdish singer, Sivan Perwer, has returned to Turkey. Singer Zeki Muren was a household name in Turkey for more than three decades. His mesmerising voice and powerful delivery earned him the love of millions. But besides being a singer he was also a composer and songwriter, a master of Turkish classical music, as well as painter, actor and designer. He was also the first man in Turkey to wear a miniskirt on stage, and many say the country's first gay icon. Now an exhibition about his life and work - named after one of his biggest hits, Here I am, Zeki Muren - has been pulling record crowds in Istanbul. Tulay Gungen, general manager of Yapı Kredi Culture, Arts and Publishing showed BBC News around. Video produced by Selin Girit and Goktay Koraltan. Music courtesy of Turk Egitim Vakfi and Mehmetcik Vakfi - charities to whom Zeki Muren donated all his wealth in his will.